By Deron Wagner|best stock & ETF picks from stock screener|Be the first to comment! Current stock market conditions are not yet ideal for leaning on the “buy button,” but here are three recent, high volume gap ups ready for pullback entry. Stocks that have� gapped up on big volume are often the best stocks to buy. This is especially true when a stock gaps to a new, all-time high following a valid basing pattern. Still, not every gap up is worth monitoring. The gap ups we pay attention to are either breaking out from a base OR gapping above their 50-day moving averages within a base (press here for a quick review of basing patterns). When a stock has already rallied 20% over a five-week period and THEN gaps 15% higher, that is not� the type of gap we are looking for. Continue reading to find out the best types of gap ups to buy, as well as our three top stock picks now (and one to avoid). Under Armour ($UAA) is a stock that recently landed on the� Wagner Daily watchlist due a high volume gap up. On the daily chart below, notice that volume spiked to 10 times its average daily volume on the day it gapped above major moving average resistance. As long as $UAA holds above its 10-day exponential moving average (teal line), we will continue to monitor the price action for potential buy entry. A breakdown below the 10-day EMA would suggest the stock is headed lower in the short term, or needs another week or two of sideways chop, before heading higher. 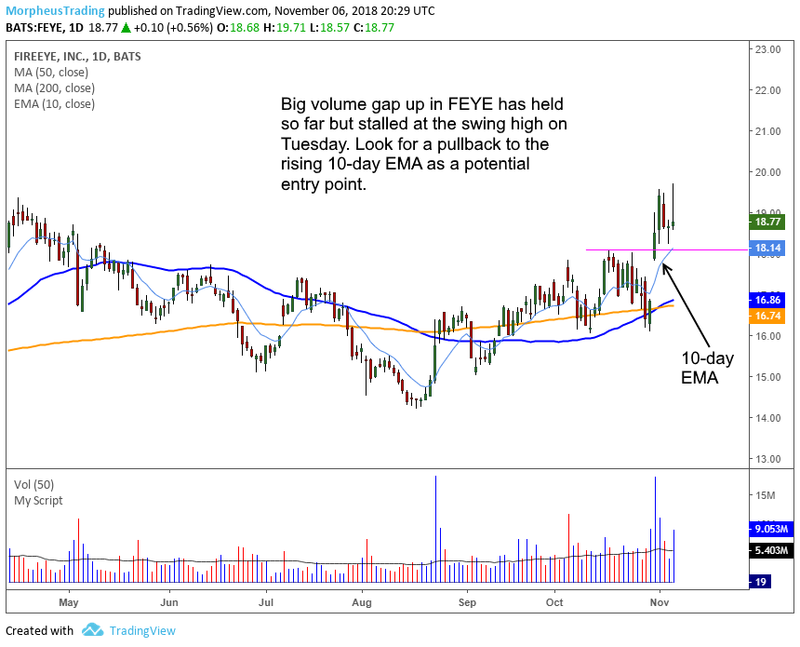 Fireeye ($FEYE) is another big volume gapper on our stock pick newsletter watchlist. 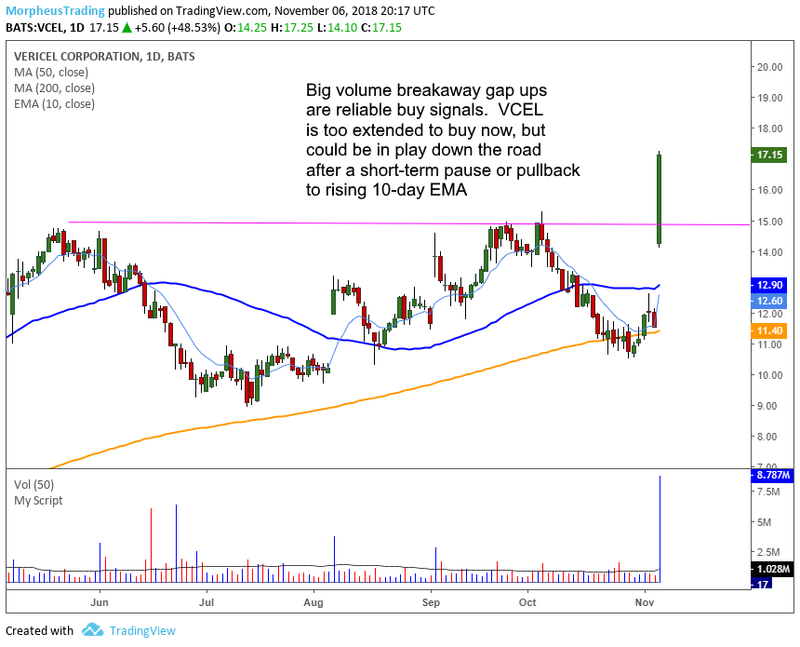 The recent gap up was accompanied by volume swelling to approximately 400% its average daily volume. Like Under Armour, $FEYE also gapped back above key resistance of its 10, 50, and 200-day moving averages. Yesterday, Vericel ($VCEL) investors were treated to a massive rally of nearly 50% that was driven by a huge opening gap on >800% average volume. Unlike other stocks that have recently gapped up, $VCEL also closed at its intraday high. The extremely bullish gap up means that $VCEL will also be added to our watchlist for potential buy entry on a pullback. As we mentioned earlier, not all gap ups are buyable on a pullback. 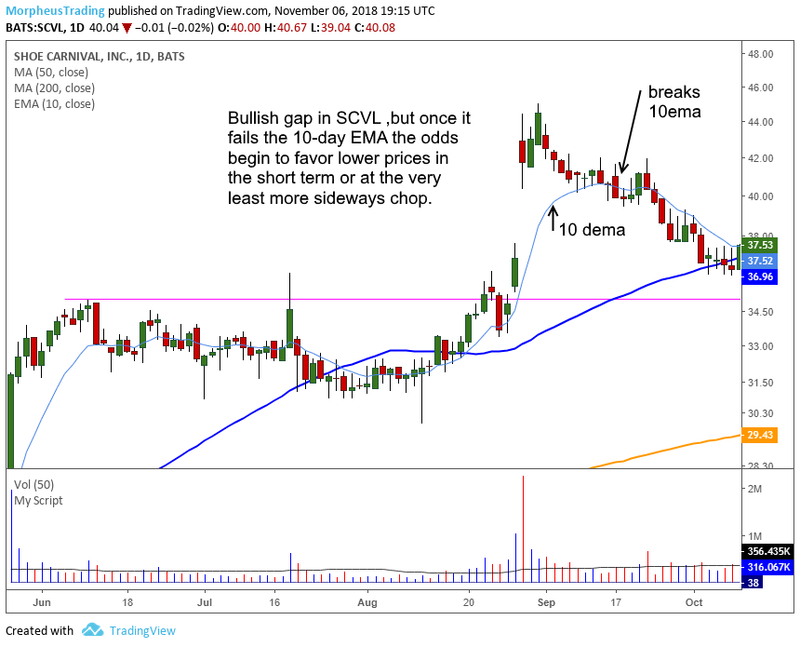 An example of a gap up failing to hold is Shoe Carnival ($SCVL), back in September. 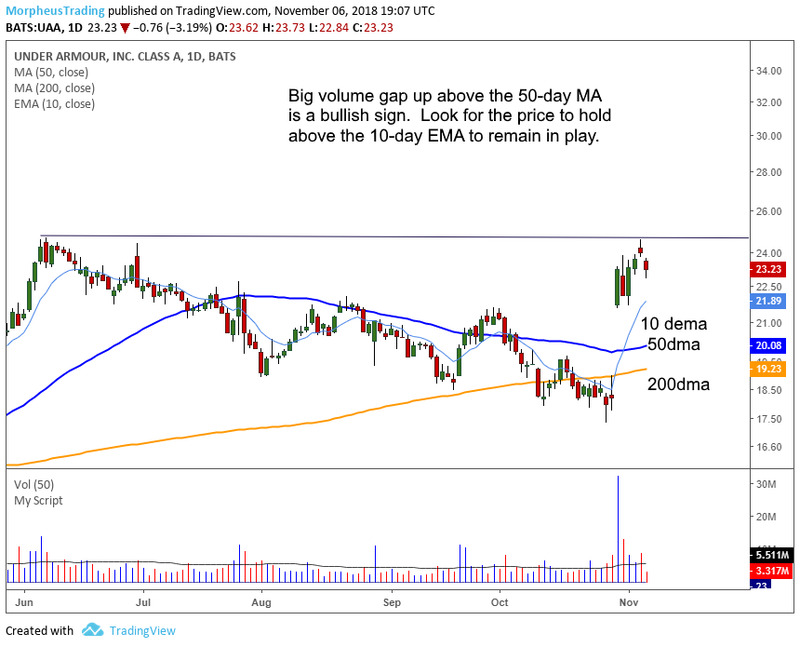 When a stock gaps on huge volume and then pulls back to the 10-day EMA, it usually presents a low-risk buying opportunity to catch the next wave up. However, when the price fails to hold the intraday low of the gap day AND its 10-day EMA support (on a closing basis), it is no longer in play for us. If you patiently wait for the pullback of a gapped stock and have a proper entry, you must always be prepared to close the trade for a loss if the stock doesn’t act right. When the overall stock market is in questionable health, gap up stocks often provide the best opportunity for profitable stock trades. However, be sure to follow the rules by waiting for a low-risk entry point on the pullback, and be ready to bail out quickly if it does not follow-through to the upside. Sign up now for your Wagner Daily subscription to be instantly notified of our exact entry, stop, and target prices for these three hot stocks on our watchlist.